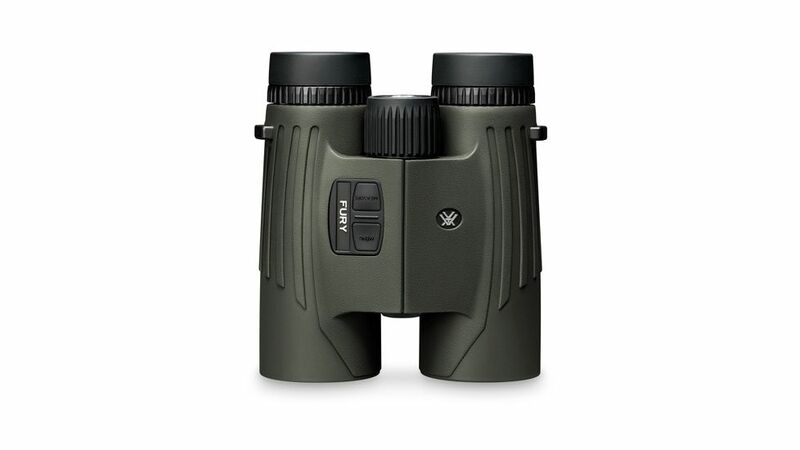 Product Info for Vortex Fury 10x42mm Laser Rangefinder Binocular The Vortex Fury 10x42mm Full-Size Rangefinder Binocular combines high quality optics with long-distance ranging technology for a binocular that is convenient, fast, efficient, and perfect for your next hunt. These Binoculars by Vortex can be operated with a single hand so you can leave your other hand free to hold your gun, bow, or other equipment. An intuitive display with modes for Horizontal Component Distance, Line of Site, and scan shows measurements in either yards or meters on this Vortex Fury 10x42 Roof Prism Binocular. For a durable, performance packed binocular, look no further than the Vortex Fury 10x42mm HD Laser Rangefinder Binocular. Specifications for Vortex Fury 10x42mm Laser Rangefinder Binocular: Finish: Rubber Armor Package Type: Box Prism System: Roof Included Accessories: Carrying Case, Neck Strap, Battery, Rainguard Magnification: 10 x Objective Lens Diameter: 42 mm Eye Relief: 16 mm Field of View: Range 6 - 314.4 ft at 1000 yds Weight: 31.8 oz Color: Green Exit pupil: 4.2 mm Binoculars Focus System: Center Focus Twilight Factor: 20.5 Water Resistance Level: Waterproof Width: 5.9 in Battery Type: CR2 Optical Coating: XR Fully Multi-Coated Diopter Adjustment Range: Range -3 - 3 dpt Close Focus: 20 ft Interpupillary Distance: Range 54 - 69 mm Tripod Adaptable: Yes Nitrogen Filled: Yes Eyecups Types: Twist-Up Strap: Yes Height: 5.75 in Fogproof: Yes Case: Yes Armoring: Rubber Armored Features of Vortex Fury 10x42mm Full-Size Rangefinder Binocular, VX-BI-LRF300 XR Lens Coatings Phase Correction Roof Prism Fogproof Waterproof Rubber Armor Multi-Position Eyecups Illuminated Right Barrel Display Right Side Controls Tapered Eyecups Center Focus Wheel Left Eye Diopter Tripod Adaptable Intuitive Display HCD Mode LOS Mode Scan Mode Yard or Meter Ranging Format Related Accessories for Vortex 10x42mm Roof Prism Binoculars: Harness Strap: Vortex Binocular Harness Strap Archer's Strap: Vortex Archer's Strap for Binoculars Tripod: Vortex Pro GT Tripod Package Contents: Vortex Fury 10x42mm Laser Rangefinder Binocular, VX-BI-LRF300 Rainguard Tethered Lens Objective Covers Comfort Neck Strap Deluxe Padded Carry Case CR2 Battery Vortex VIP Warranty The Vortex VIP warranty is about you, not us. It's about taking care of you after the sale. VIP stands for a Very Important Promise to you, our customer. We will repair or replace your Vortex product in the event it becomes damaged or defective-at no charge to you. If we cannot repair your product, we will replace it with a product in perfect working order of equal or better physical condition. You see, it doesn't matter how it happened, whose fault it was, or where you purchased it. You can count on the VIP Warranty for all Vortex Optics riflescopes, prism scopes, red dots, rangefinders, binoculars, spotting scopes, tripods, and monoculars. Unlimited Lifetime Warranty Fully transferable No warranty card to fill out No receipt needed to hang on to If you ever have a problem, no matter the cause, we promise to take care of you Note: The VIP Warranty does not cover loss, theft, deliberate damage or cosmetic damage that does not hinder the performance of the product.